What: The Barnstormers visit the Screaming Eagles in the first-ever meeting between the teams. When: Friday, June 2 at 6 p.m. (PST). Where: Maverik Center; West Valley City, Utah. 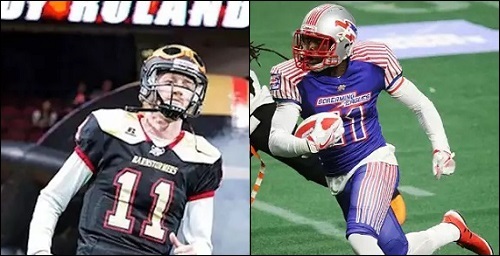 Note: This week 16 match up features the IFL's week 15 Offensive Player of the Week (WR Brady Roland of the Barnstormers) and week 15 Defensive Player of the Week (DB James Calhoun of the Screaming Eagles). For more details, see the EXTRA section below. The Barnstormers are 11-2 overall, 2-5 on the road and 3-0 in inter-conference play. Iowa is coming off a 64-12 home win over the Green Bay Blizzard on May 26. They are averaging 43.2 points per game and are allowing 36.2 points per game. The tied for first in the United Conference. The Screaming Eagles are 4-9 overall, 2-4 at home and 1-1 in inter-conference play. Salt Lake is coming off a 64-27 home win over the Cedar Rapids Titans on May 29. They are averaging 43.1 points per game and are allowing 48.1 points per game. The Screaming Eagles are fourth in the Intense Conference. The Barnstormers have the best record in the Indoor Football League, and for the past two-plus months, they've been playing like it. Iowa has reeled off nine straight wins after a 2-0 start. They are in the driver's seat for a potential United Conference title and this game is the next step in striving for that. It's entirely realistic that the Barnstormers could end up winning that title. If they win out, including defeating the Sioux Falls Storm in the final game of the season, they will finish with the league's best record and have a home date in the first round in the playoffs. 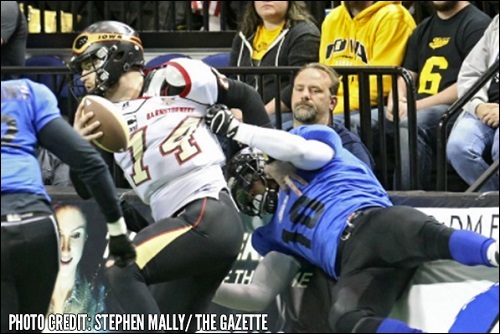 Iowa, in its third IFL season, has found its footing and is poised to make some noise. The franchise re-located from the Arena Football League, and struggled through its first two seasons. The team had success in af2 and the AFL, but has been looking for their first taste of success in the IFL. That could be on the imminent horizon depending on how the season pans out. Quarterback Travis Partridge is in the top half of most statistical categories, and has been solid since the winning streak began. He has led this team the entire season Like the Screaming Eagles' Verlon Reed, Partridge has appeared in all 13 games for the Barnstormers. He is completing 59.4 percent of his passes and has 157 passing yards per game. He averages 41.4 rushing yards per game, but he has some help in that area. Keshaudas Spence is averaging an even 5.0 yards per carry and has rushed for seven touchdowns. Brady Roland is a solid target for Partridge. The week 15 Offensive Player of the Week is third in the IFl in receiving yards per game at 57.3 and second to only the Colorado Crush's Kyle Kaiser in receiving yards on the season. Ryan Balentine and Lucas Hefty, who have also appeared in all 13 of Iowa's games this season, are formidable weapons. Balentine has a 12.4 yards per catch average and 10 touchdowns on 51 catches, and Hefty has caught 45 passes for 412 yards and seven touchdowns. Javicz Jones has a statline to which Defensive Player of the Year voters could be drawn. With 99 total tackles, three interceptions, four pass breakups, two sackes two forced fumbles and a blocked kick, he is a force to be reckoned with. Ra'Shawde Myers has a league-leading 11 sacks. DaeJohn Love has five interceptions and three fumble recoveries. To win their 10th straight, the Barnstormers need to keep doing what they've been doing over the past nine games. If Myers can get to Reed as ferociously as he's gotten to other opposing quarterbacks this season, they could create some major difficulties for Salt Lake's Reed. The Screaming Eagles are coming off their biggest win of the season, a 64-27 win over the Cedar Rapids Titans. The Screaming Eagles trailed the game at halftime by three points, but outscored the Titans 40-0 in the second half on some spectacular defensive plays by James Calhoun and Rashad Greene The duo combined for three interceptions returned for touchdowns in the second half alone. Calhoun was named the IFL Defensive Player of the Week for his three interceptions returned for touchdowns in the game. Still, Salt Lake is, by all accounts, a team without an IFL future. The FANchise has abandoned the league's commitment to live Youtube broadcasts in favor of creating a new "Interactive Football League" next season (They have reportedly been fined for not adhering to the IFL's commitment to Youtube, but have continued to showcase the team on a slow-loading site known as Twitch). By all reports, Project FANchise's run in the IFL is over. This is likely to be the final season for the Screaming Eagles. The question is, how will head coach Matthew Sauk and his players react to the situation? According to SCtoC's exclusive interview with coach Sauk, he doesn't pay attention to those issues. Instead, he works with his team to get them ready for the next game. The coach does not engage in the outside rhetoric of Project FANchise, and that is a great thing. All coach Sauk wants to do with the Screaming Eagles is to coach the team. Verlon Reed has been incredible this season. Surely already an Offensive Rookie of the Year candidate, completed just nine of 20 pass last week, but did not turn the ball over. With his defense taking over the load, Reed really was not asked to do much. Still, his effort will needed against arguably the best team in the IFL. It took a while, but maybe the Screaming Eagles have found a go-to running back. Lucien Walker, in his first game with the team, rushed for 44 yards and two scores, including a 29-yard scamper in the final minute. Devin Mahina is the big target at receiver. He is averaging 46.2 receiving yards per game. Robinson is emerging as a big play threat. In just five games he has 17 receptions for 247 yards and two scores. Running back James Poole, who second to Reed in rushing touchdowns with five, is a threat out of the backfield with 24 catches for 216 yards and 3 touchdowns. Mahina and Reed are the only two Screaming Eagles offensive players to play in every game this season. That can also be said for Ed Burns and Rashad Green, as well as Seante Williams. all have played in every game. The hero of the defense is James Calhoun, who leads the IFL with seven interceptions with five of those taken to the house. Calhoun is the only IFL player to be named Defensive Player of the Week twice. Jerome McElroy has has three sacks in just five games. Defense will be the key for the Screaming Eagles. In the best defensive efforts of the season, they will need to be sharp to contain a complete Barnstormers offense. Reed will need to be accurate and avoid mistakes, like he did against the titans last week. June 3 - Sioux Falls Storm (11-2) at Colorado Crush (3-10), 4 p.m. This will be a bit of a special match up between these teams. Barnstormers WR Brady Roland (left) was named the Indoor Football League's Offensive Player of the Week for week 15. 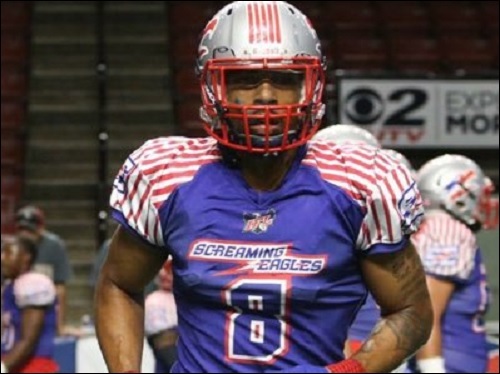 Conversely, Screaming Eagles DB James Calhoun was named the IFL's Defensive Player of the week for week 15. In Iowa's 64-12 win over the Green Bay Blizzard last week, Roland caught five passes for 92 yards and three touchdowns. He leads the Barnstormers this season with 60 receptions for 745 yards and 18 touchdowns. In Salt Lake's 64-27 win over the Cedar Rapids Titans last week, Calhoun intercepted three passes and returned all three for touchdowns. He had 2.5 total tackles. He finished the game with 126 interception return yards. He leads the IFL in interceptions with seven, and has interceptions returned for touchdowns with five. If the Screaming Eagles win how does it affect the Nighthawks playoff hopes? I like the Extra section this week. It should be a fascinating Match up. Getting geared up for this. Barnstormers win the toss and defer. The Screaming Eagles will have the ball first. Theoretically, it would help the Nighthawks. I can tell more after this weekend's games. Not watching on twitch. This time, I'm listening to the Barnstormers' radio broadcast. Touchdown Screaming Eagles. Devin Mahina 33 yard pass from Verlon Reed. Scott Thomsen kick. Heck of a kickoff return. Reed looks better already tonight than he looked in last week's game. Touchdown Barnstormers. Ryan Balentine 6 yard pass from Travis Partridge. Kentun Chun kick kick. We could be looking at a shootout tonight. I used to like Patrick Dees but after the Interactive Football League nonsense, he comes off like a snake oil salesman. He should have been caught by the boards before that.